5-fluorouracil is a frequently used and central agent in the treatment of certain malignancies including those of the breast, gastrointestinal tract, and upper aerodigestive system. While many analogs of 5-fluorouracil have been synthesized since the early 1960’s none has supplanted 5-fluorouracil for general clinical use. One of the major focal points of recent investigative work has been efforts to enhance the activity of 5-fluorouracil through biochemical modulation. The mechanisms by which malignant cells become resistant to the cytotoxic effects of 5-fluorouracil are manifold 1. Resistance mechanisms in in vitro model systems have included alternations in the anabolism and catabolism of 5-fluorouracil, decreased incorporation of 5-fluorouracil into nucleic acids, a relative deficiency in intracellular folates, and qualitative or quantitative alterations in the target enzyme thymidylate synthase. While each of these mechanisms has been documented to occur in preclinical model systems, few have been shown to be responsible for clinical insensitivity to 5-fluorouracil. Since the underlying molecular mechanism of the catalytic function of thymidylate synthase has been disclosed, several investigators have recognized the need for adequate intracellular levels of the folate substrate 5, 10-methylenetetrahydrofolate, to optimize the cytotoxic effects of 5-fluorouracil via ternary complex formation with thymidylate synthase and the tluorinated nucleotide FdUMP 2,3. Early investigations demonstrated that malignant cells were capable of growth with intracellular levels of folates that were suboptimal for ternary complex formation with fluoropyrimidines 2. In these cells the addition of endogenous folates could be used to markedly enhance ternary complex formation and thus the cytotoxicity of fluoropyrimidines. These observations have since been extended to clinical trials which have demonstrated the clinical benefit of leucovorin given concurrently with the fluoropyrimidine agents4–7. 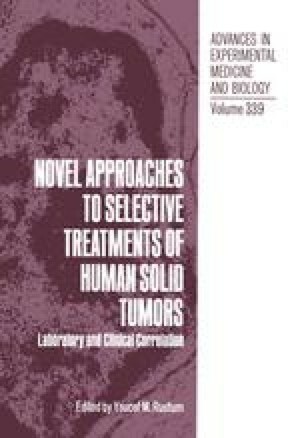 The relative success of these clinical investigations strongly suggest that relative intracellular folate depletion is an important mechanism by which malignant cells become resistant to fluoropyrimidines in patients and that thymidylate synthase is a critical chemotherapeutic target. Given the merits of leucovorin, recent preclinical and clinical investigations have focused on optimizing the dose and scheduling of leucovorin. Our laboratory has used a human colon (HCT-116) and a human breast (MCF-7) carcinoma cell lines as in vitro model systems to investigate the cellular metabolism of leucovorin8. A series of investigations by Houghton and colleagues using a human colon xenograft model in immune-deprived mice suggests that the critical tetrahydrofolate and 5,10-methylene-tetrahydrofolate intracellular pools may be increased by up to 4-fold using prolonged (24 hrs.) infusions of leucovorin9,10. When compared to short, high dose leucovorin exposure, these authors concluded that prolonged infusional exposure to leucovorin was optimal for increasing the intracellular pools of tetrahydrofolate and 5, 10-methylenetetrahydrofolate and represented the most efficient means of generating the higher polyglutamate forms of these folates. Several investigations have demonstrated that the higher polyglutamates of 5,10-methylenetetrahydrofolate are 50 to 100-fold more potent in potentiating ternary complex formation with thymidylate synthase and FdUMP when compared with the mono- and diglutamate forms of this folate11,12. It has also been demonstrated that the higher polyglutamate forms of both folates and antifolates have a prolonged intracellular retention8,13 These findings suggest that schedules which optimize the formation of higher polyglutamates of tetrahydrofolate and 5,10-methylenetetrahydrofolate would be optimal for the modulation of 5-fluorouracil. This concept is further supported by an investigation by Romanini and colleagues which demonstrated that leucovorin was ineffective in increasing the cytotoxicity of 5-fluorouracil in cells incapable of metabolizing folates to the higher polyglutamate forms.